This is not the first, nor will it be the last, time I must correct myself. A blog is a work in progress and there is no end to what we learn. Therefore, mistakes are part of the game. Sometimes, though, they are sweet, and this is one of them. The main character of the chronicle "Hybrid". Note the long feed inside the orange ink deposit. 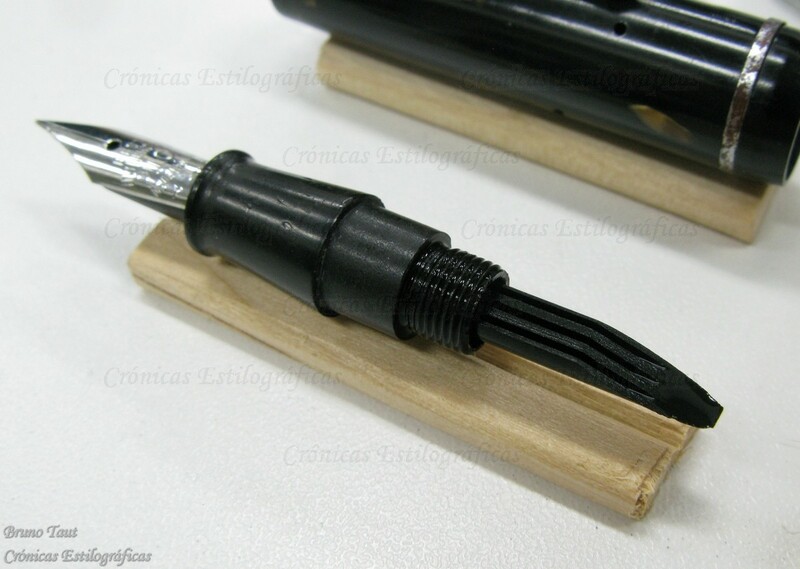 Some months ago, I wrote a chronicle about a strange pen. A Pilot pen, actually, from 1938. Its most striking feature was a strangely long feed that entered well into the ink deposit for no apparent reason. This deposit, on its side, was screwed to the section. It really looked like a re-usable cartridge. 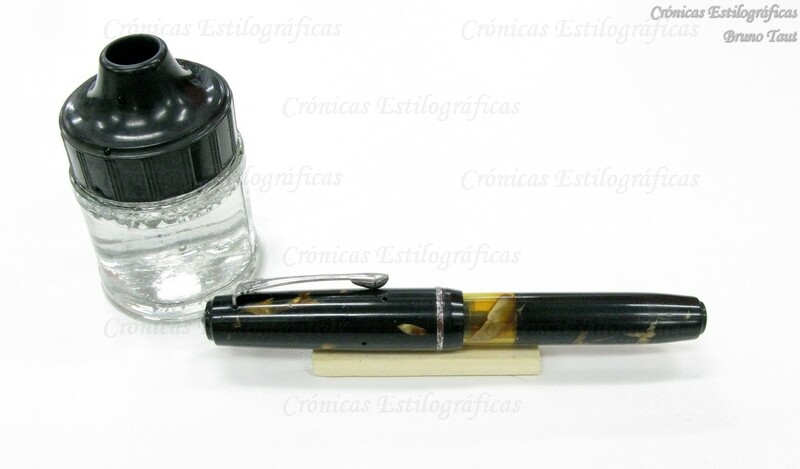 But at the same time, it was also a sort of eyedropper pen with a reduced ink reservoir. That is why I named that chronicle as “Hybrid”. Was I mistaken! Reality was a lot more exciting. And that is why my mistake was so sweet. A short version of the previous pen, together with the nomikomi-shiki inkwell. These inkwells are really difficult to find nowadays. 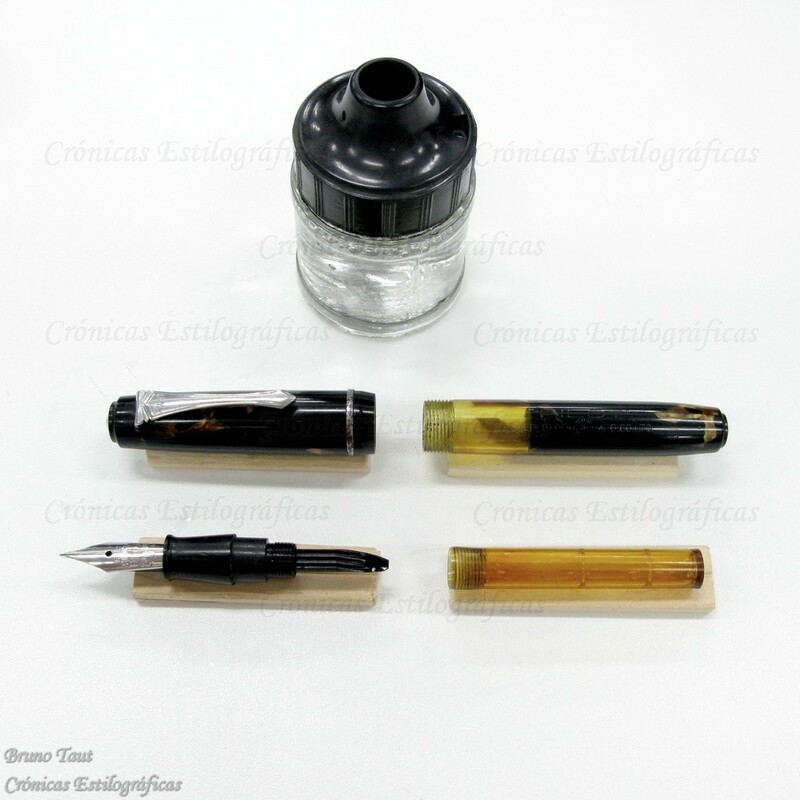 This family of pens was released with an ad-hoc inkwell that allowed a very special and original filling procedure. This inkwell had a hole with a neck in the cap, inside which there are four sealing-rubber lips. 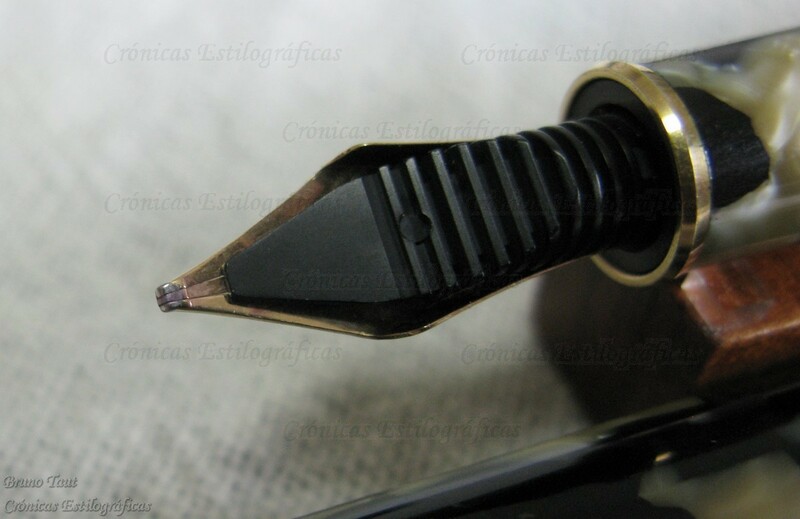 To ink the pen, the user had to introduce it, uncapped, nib down, in the inkwell. Then, flip the inkwell and the pen upside down (crossing fingers for the rubber seal to work well, thus avoiding a massive ink spillage). Gravity and the capillarity of the extra-long feed worked together to fill the ink deposit very efficiently. 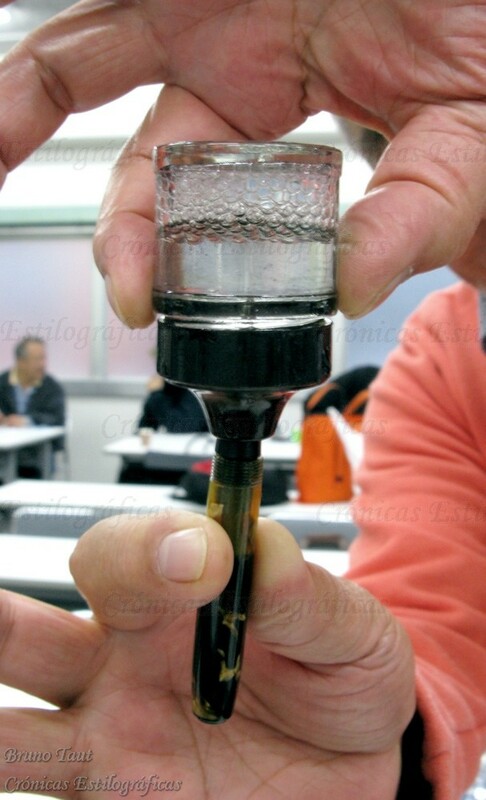 This procedure, named nomikomi-shiki (呑込式) or, in English, easy-drink filler, can be seen on the following videoclip. Pen and inkwell in the moment of filling the deposit. The insides of the short nomikomi-shiki pen. Indeed a sweet mistake as the reality proved to be a lot more interesting and original that mi initial guess. 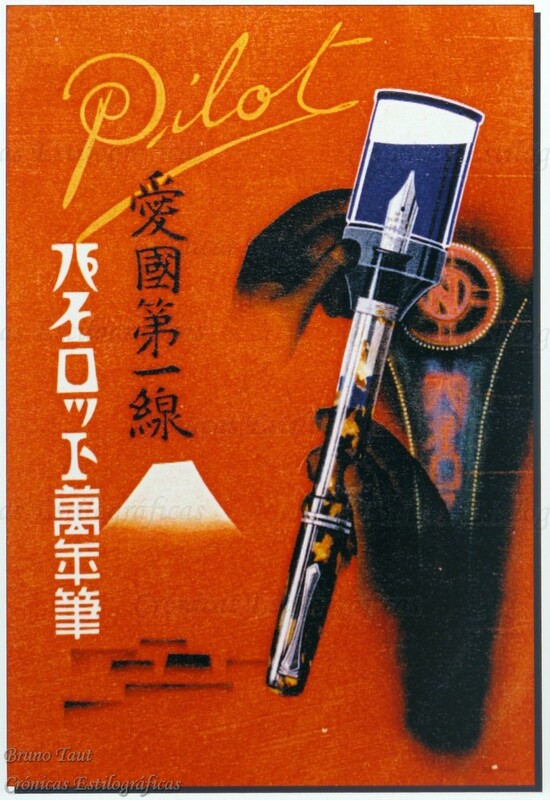 Advertisement of the filling system as shown at the Pilot Museum, Pen Station, in Tokyo. Fascinating filling system. Thank you for introducing me to yet another interesting pen. I would imagine these pens are rare but I would like to try one. Kindly let me know if you know a source. 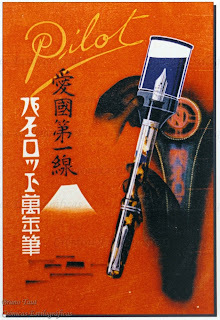 A source of nomikomi-shiki pens? Hard to find, but I'll keep you posted. I was at the Chicago Pen show last weekend and bumped into Andreas Lambrou where he was promoting his latest book, Fountain Pens of Japan. He and the co-author, Masamichi Sunami, spent more than two decades researching the book and the hard work is apparent. I mentioned my discovery about these rare pens and he instantly flipped to the pages where he has covered them - great pictures too. Finally he too wished me good luck for finding one. As you can see you were very lucky finding such an original pen. Now be careful with it--vintage pens are delicate! Leaving it in a car? Don't do that, for god's sake. The inkwells of this filling system are are, very rare, and expensive.